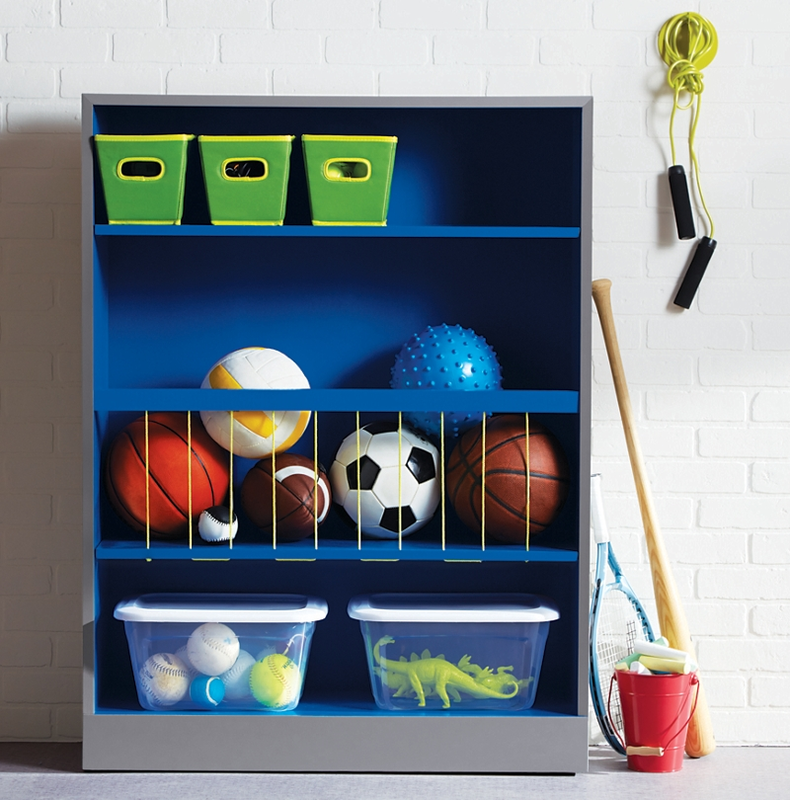 Turn an unused bookshelf — or curbside find — into colorful garage storage. Sand the bookshelf inside and out to remove any glossy finish and to smooth out the surface. Drill 10 holes down through the 3” x 2” piece of wood, to accommodate the nylon rope. Mark the wood so that the holes are evenly spaced. Attach to the front of the bookshelf as shown with brads. Fill any holes created by the brads with wood filler. Let dry and sand smooth. Wipe down the whole unit with a tack cloth to remove all dust. Spray inside and out with Krylon® ColorMaster™ Primer in Gray. Let dry. Spray the inside with Krylon® Fusion All-In-One™ Gloss Patriotic Blue. Let dry. Tape off the inside of the bookshelf and cover with newspaper. Spray the outside with Krylon® Fusion All-In-One™ Gloss Vintage Gray. Let dry. Thread the nylon rope through the holes by tying a knot in the lower left, thread through all of the holes and finish with a knot in the lower right. Letting the paint cure for up to 72 hours prior to adding items will help keep the finish looking nice for a long time.